A delightful ending to a perfect evening in Rome was not meant to be. I would never have guessed that I would be lost, wandering those early morning streets that I thought I knew so well. The evening had begun with lots of merrymaking surrounded by friends at a popular pizzeria in Trastevere. Night time was in full swing, and the winding cobbled streets were alive with activity. Street bands played in nooks along the way while outdoor tables filled to the brim with locals and tourists enjoying the warm summer atmosphere in Rome’s most sought after nightlife destination. 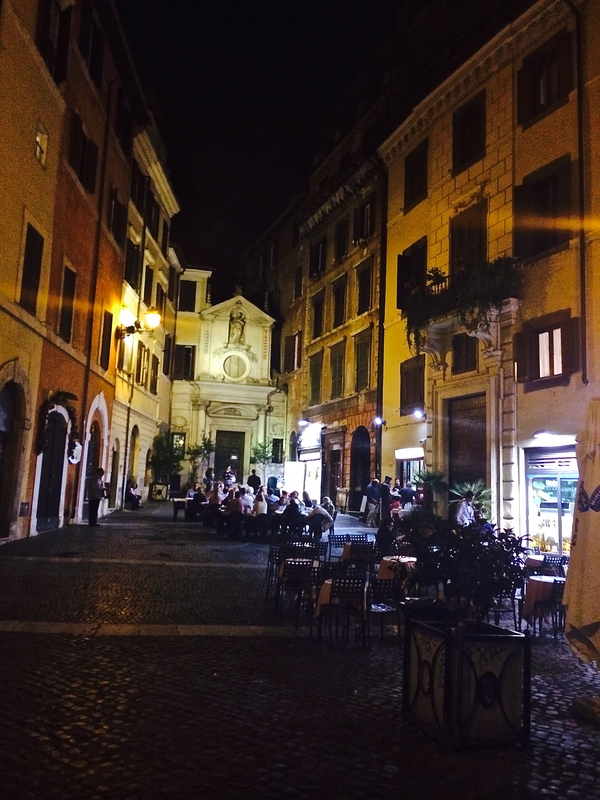 Trastevere, that former “seedy, wrong side of the river” place that draws one back time and again. After dinner, we made our way through the throngs of people littering the narrow streets, checking vendor’s tables and enjoying the atmosphere. It was getting late, so we made our plans to meet up in the morning before going our separate ways. 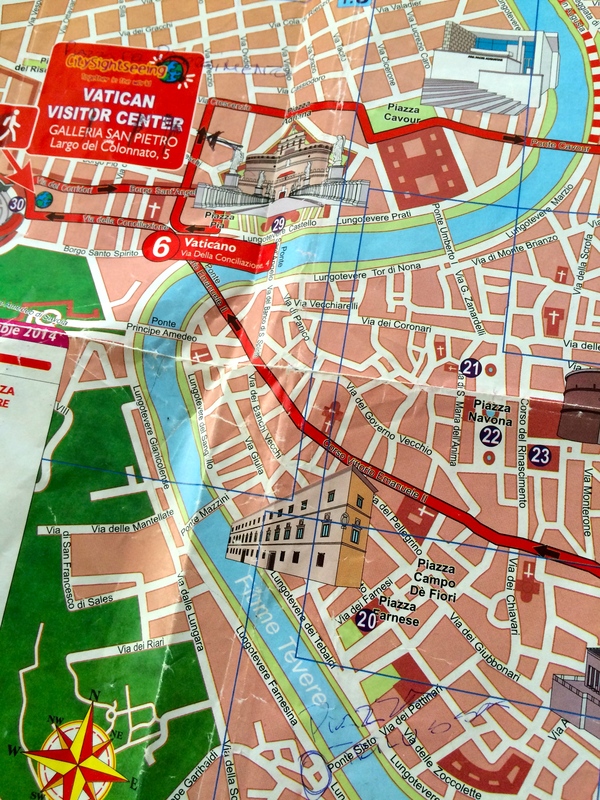 I was given a map to find my way back on foot to my hotel. It seemed simple enough. I just needed to follow the Tiber River northward until I reached Castel Sant’Angelo, then turn westward down a street. There in lied the problem. No one could remember the name of the street. I was staying at the “new” Castel Sant’Angelo Inn which was only half a mile from Castel Sant’Angelo itself. I assured my friends that I would recognize the place when I saw it. Here is my map. If you look at the bottom you can see a circle where I left my friends. I walked up along the Tiber River northward until I reached Castel Sant’Angelo. Then I turned left toward the red patch on the map covering a number of streets. My hotel is there….somewhere. Oh what a night! I followed the Tiber up to Castel Sant’Angelo and found the first street heading westward. I stopped to examine the map again, noticing the huge patch of advertisement stamped over the names of the three possible streets. Since I didn’t have a name, what did it matter. I can find this place. I started down the street a ways and turned northward after what I assumed was about a half mile. If my hotel was not here, it must be on the next street. And so it went until everything looked the same to me. I was convinced that I would recognize my hotel, but I could not find it. I kept admonishing myself that it was only a half mile away, that it had to be very close to me….but where? I texted my friend for help and she said she would find the name of the street and text it back to me. I had opted for the no data plan for overseas phone options, so I could not look my hotel up. While I waited, I asked several locals, pub owners and couples out for a late night stroll, for help. They looked at the map and shook their heads when I mentioned the Castel Sant’Angelo Inn. Since it was a new hotel in an old-established building, they had not yet heard of it. My heart was sinking. Before long I got a text with the correct street name. A flood of relief. I gave the address to a pub owner who took me outside and gave me directions consisting of turn this way and then that, etc. I followed what I thought he said but got lost again. Finally, after countless inquiries and attempts, I found a taxi parked on the side of the road. With unmasked desperation, I gave him the street address. He gave me directions about turn this way and that. I told him I would pay him to take me there. He said no, I could find it, then gave me a “move along now” motion with his hand. I turned on my heel and quickly acted on his directions, forcing my mind to stay relaxed. To my great delight, I found it. Key in hand, I was inside the hotel in a flash and made a beeline straight to my room. I gazed at my alarm clock on the nightstand. It was two thirty in the morning. As I lay in bed trying to get a few hours sleep before meeting up with my friends, I thought about my wanderings. Although I was frustrated, I never felt that I was in danger. People tried to be helpful but with such little information it was impossible. I was sure I would recognize my hotel, but I learned that after dark everything looks quite different and how very easy it is to get turned around. Needless to say, we all had a good laugh together later that morning after everyone got over the initial shock that I had actually “got lost.” So, from now on I will always have my own detailed map with me. I’ll just mark this one down to experience. I would never have problem being lost in Rome. 😀 Now that it ends well, you got this night will be more memorable because of the misadventure – or should I say adventure. 😉 I got lost in Paris with my friends waiting for me to leave the city. Yikes! Me wandering around aimlessly was unforgetful. I was embarrassed to admit it at first, but now that I can laugh at myself, i’m good with it. And I know many others have had similar experiences. No one is alone:) Lesson to be learned is: carry a well-marked map with your hotel marked on it!! It is the most awful feeling when you are lost, especially if don’t know the language all that well. The same thing happened to me while I was in Paris. Fortunately it was during the day! Such a relief when you DO find your way back! At least you felt safe…that is the most important part…. Your adventure sounds a bit scary. It would be very isolating not know the language. I understand all too well your sense of relief when you found your way back! That is something i’ll not soon forget. Thank you for sharing your experience Raj. I too was lost in Rome. But I was with a business colleague. Completely lost in a residential area, we peeked past hedges and fences, curious about the people who lived there. I don’t know why we never got concerned, afraid or worried. We arrived at our hotel hours later, happy to see it but happy for our adventure. We became good friends that night, wandering the streets as they wound around and turned us around. Thanks for your post; it reminded me of this lovely evening. Your “lost” sounds like an adventure! I would be curious about the homes too…nosey me:) But, it is always more fun to get lost with a friend. Thanks for the input. I really enjoyed your post. Lost in Rome at night is always interesting. Once I got on an express bus by mistake and had to figure out my way back. I was fortunate I am not still wandering around Rome! Isn’t it nice to be in a city where you are not afraid so late at night! I want to get lost someday like you.. Only in Rome 😉 What an introguing story! Thank you Ishita….for some reason I keep finding your replies to my posts in spam. I don’t know why but I will just keep checking. 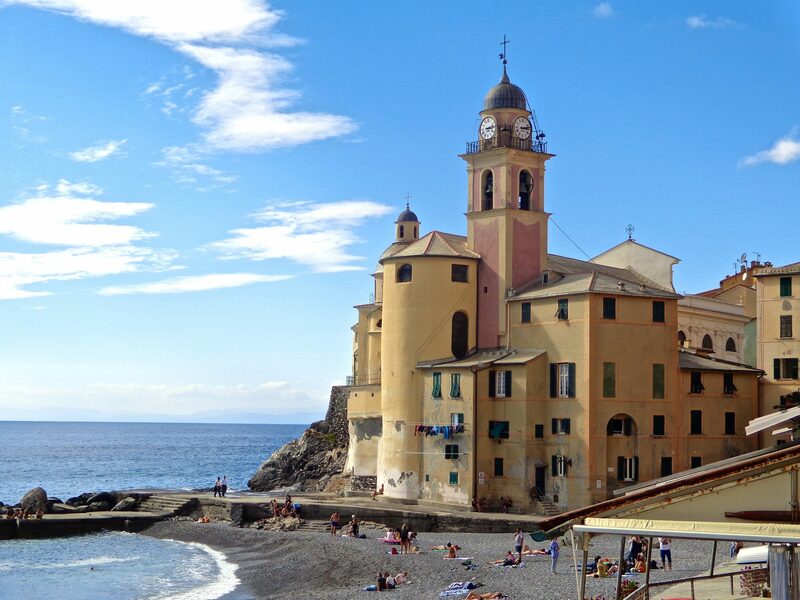 On one trip to Isola Giglio I was sent ahead to try and find a restaurant we (my husband and an older couple who were with us and having trouble walking uphill) were looking for amidst the rabbit warren that is the castello/borgata at the top of the highest hill on the island. One or two turns and I was suddenly completely turned around. It was only about 10 min. but I was near tears as every little vicolo looked the same and I couldn’t even find my original starting point. I ended up shouting their names over and over and eventually we reconnected. I seriously thought I might not find them and then how would we all get back together to return to the boat! !